Diary of a Ledger: #tweetathon 2009 - How's it gonna work? 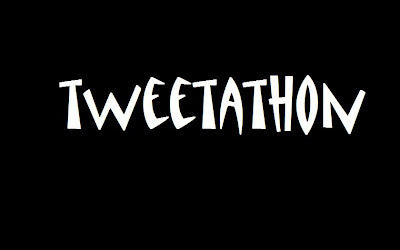 #tweetathon 2009 - How's it gonna work? From midnight tonight I will be tweeting every 10 minutes for 48 hours for charity. It is as simple as that really. However there are a few things to add into that. If twitter goes down I will use my facebook fan page, which you can find here. I know that it's weird I have one but I know some of you read that instead of this site anyway. It is also entirely possible that whilst gathering supplies earlier today I forgot something crucial so I may need to leg it to a shop at some point but I figure as long as I still squeeze in 6 tweets an hour you'll forgive me. My twitter account will be unprotected at midnight tonight until midnight on Tuesday and I will be as good as I can be in terms of language that I use. But I make no promises of not swearing at all, it really wouldn't be me if I didn't. @ replies will count as a tweet, as they are public, but DM's will not. Also if all of you out there can refrain from phoning me until late afternoon on Wednesday I'd really appreciate that. Yes that includes today as I need to get some shut eye before I start. Sorry Mum. Texts are fine though. Finally but most importantly this is being done for a really good cause. BASICS do provide a unique service that saves lives but they do need your help so please give as much as you are able to. And remember if I raise a grand I will do something special to mark it. You can donate at my Just Giving page here. Oh and for those of you that read Diary of a Ledger but aren't on twitter 'yet' you can find my page here and you'll be able to watch my progress even if you don't have an account once I've unprotected it. Fickin' hell this is on like donkey kong!!! Yikes!! !